Is Pinterest a dying breed? Isn't it just for foodies, DIY weddings that probably won't turn out like the picturess and furniture we'll never be able to buy? Amazon doesn't think so. 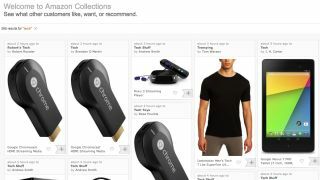 In fact, the giant e-commerce site has just quietly created its own Pinterest-style page called Amazon Collections. The items you can "collect" however, are strictly from Amazon's own website vs Pinterest's pin whatever from wherever policies. The overlay is pretty simplistic right now since it's still in the testing stages, so we expect it to get a little bit fancier as more people begin to use it. For now, users can browse topics like books, movies and collections they are following, plus create their own collections to share. Each Amazon product page will also begin to feature an "Add to Collection" button but since that will take awhile to roll out completely, they've created a "Collect" button that you can drag to your bookmarks bar, which is similar to their Amazon Wishlist extension. How 'bout collecting some of our blips? Or pinning if that's more your thing.